Scentrics answers the challenge of privacy for the internet. Our vision is to integrate into every connected application, platform and device making the internet safer for all users. 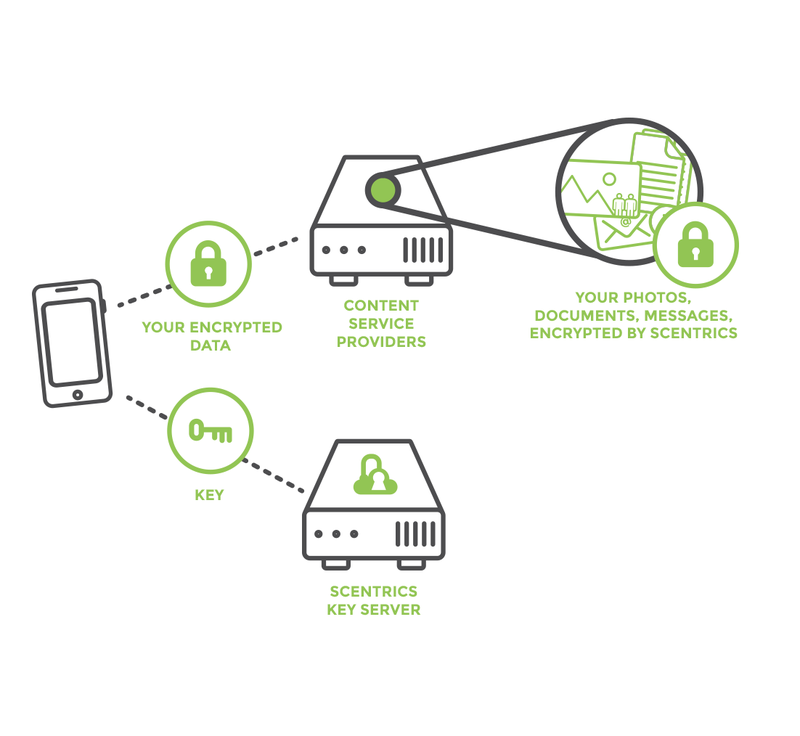 Scentrics gives users complete control of who has access to their data. Consumers can control access to anything from photos to Social Media to health records. Businesses have control over who can access everything from files, emails or access to industrial sensor data. Using our Privacy enhanced machine learning techniques, users can control what information is privately extracted from their data. This means users take ownership of the trading of their data which has other important applications such as moderation and threat detection. The vision is for a world where all data will be encrypted on the device, in transit and in storage with users giving and managing permissions of who can get access to that data. Scentrics is a cybersecurity and artificial intelligence business, with strong ties with UCL, a public research university in London, UK, that solves some of the most intractable challenges that limit truly scalable privacy across the internet. The solutions Scentrics has delivered have been developed by global experts in cybersecurity, machine learning and software engineering. Against this background, the use of cryptographic techniques, such as encryption and digital signatures, to protect information is absolutely vital. Cryptography can be used to guarantee confidentiality, to enable detection of unauthorized changes, and to guarantee the origin of data. Although solutions exist to protect sensitive content and data, whether stored or in transit, it can be difficult to use or to integrate into a workflow. Traditionally, key management is the answer, but it can be cumbersome, slow and difficult to scale. Issuing keys, storing them securely and using multiple devices also causes major problems. The key innovation by Scentrics is to solve the key management problem in a way that makes life extremely simple for developers and end users. It transparently supports the management and transport of cryptographic keys between individuals, enables users to transparently use multiple platforms and still access their keys, and provides a secure and long-term solution for key storage. This is achieved by deploying a cloud-based global security service. This generic service can be provided by Scentrics itself, or by any other service provider prepared to licence the Scentrics software. This service supports the full range of key management services, including key generation, key storage, key distribution, and key destruction, all under the control of the owner of the keys. Provision of this service by a known and trusted party ensures user confidence in the long-term security and management of their cryptographic keys, and hence of their data. Users choose who they trust, quite independently of what services they use for data storage and communication, i.e. it decouples the provision of data services and the trust that user rights over the data will be respected. 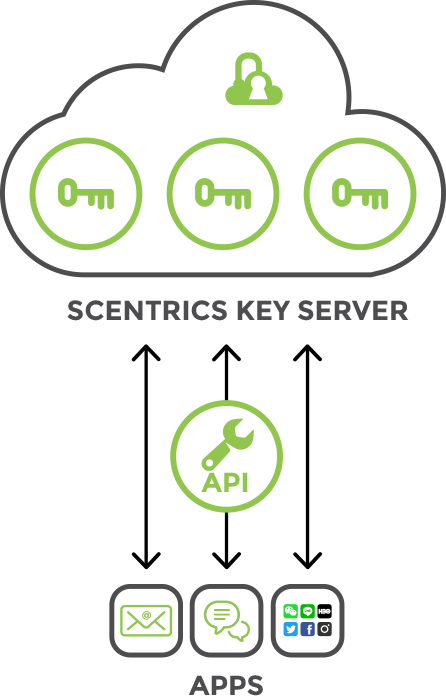 A user or device, for example in an IoT content, simply authenticates to the Scentrics server, and the keys are securely and automatically downloaded to the user device. These keys are then used as necessary, and the local copies are deleted as soon as they are no longer required. This means that if a device is lost or compromised the keys are not taken since they are never stored long term on devices. Keys cannot be lost since they are securely stored by the Scentrics service provider. The fact that the Scentrics service is cloud-based enables simple and secure regulatory oversight, including lawful access to data. Depending on the laws applying within the jurisdiction in which the service operates, lawful access can be given on a highly granular level to individual keys, e.g. enabling the decryption of individual protected data items, or equally all emails sent to or from a specified individual.